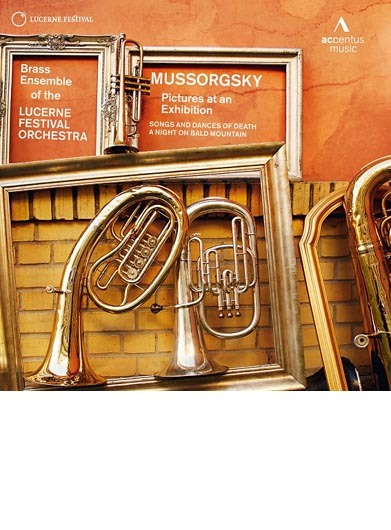 2013, the LUCERNE FESTIVAL ORCHESTRA celebrates its tenth anniversary, and this summer, the Brass Ensemble of the LUCERNE FESTIVAL ORCHESTRA also looks back over a decade of performing. In preparation for this anniversary, Accentus Music publishes the first CD of this internationally renowned Brass Ensemble, featuring works by Modest Mussorgsky.The disc brings together the “who’s who” of the Brass world: Every year, the Brass players of the LUCERNE FESTIVAL ORCHESTRA, founded by Maestro Claudio Abbado and Michael Haefliger in 2003, join to form an exclusive chamber music ensemble. Together with “guiding spirit”, trumpeter Reinhold Friedrich, they celebrate Abbado’s vision of chamber music collaboration at the highest level. The ensemble’s first CD is dedicated to Modest Mussorgsky, who was described by Dmitri Shostakovich as the “greatest Russian composer”. This release was created with the support of the “Friends of the LUCERNE FESTIVAL”. Booklet text in German, English and French.